(i) soft fleshed(koozha) and (ii) firm fleshed(varikka). The firm fleshed type is highly tasty, sweet and crisp. The 2 groups are further classified depending on the taste, size of fruit, odour of flesh, nature, shape and diversity of prickles on the rind. Singapore or Srilanka jack: Introduced variety from Srilanka. It bears fruits in 3yrs after planting and is extremely precocious in habit. 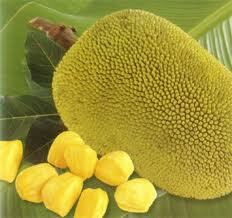 The fruits are more or less the same size as the common jackfruit. A tree may yield as many as 250 fruits. Sindoor- highly sweet variety with attractive sunset orange coloured flakes. Bear medium sized (11-12 kg) twice a year. Grafts can be used for planting. For grafting, raise seedlings in polythene bags and when they are 9-12 months old do inarching. One month after grafting, behead the root-stock above the graft joint. A new method of approach grafting utilizing sprouted jack seedlings (maximum 20 days old) as root stock and tender shoot tips of 2 to 3 weeks old with one or two tender leaves as scion is successful, fast and cost effective. Excellent drainage and adequate watering need to be ensured. At no stage it should be exposed to drought and frost. It is useful to provide some protection, especially to young trees. Jack is rarely manured. 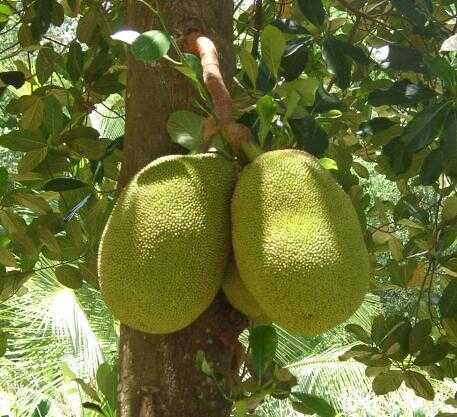 Even without fertilizer application, the jack trees come up well under Kerala conditions. Mealy bug: Spray lime sulphur or dust sulphur. Pink disease, Stem rot, Fruit rot, Budrot : Pruning of affected plants and protecting the cut- ends with Bordeaux paste are recommended. A process protocol developed for canning of tender jack involves treatment combination like blanching process, thermal processing parameters via; time, temperature, and preservatives wrer optimized based on the quality analysis and shelf life studies. The study concluded that the samples which were blanched for one minute at 100o C and pasteurized at 900 C for F value 10 were found to be superior. 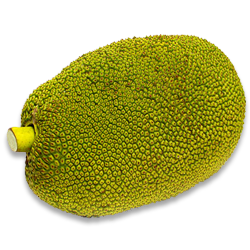 A shelf life of 2 years could be achieved for pasteurized and sterilized tender jack fruit at refrigerated storage and ambient condition respectively, using this new technology. The product resembled the fresh sample, available to the consumers in a ready to cook form throughout the year.